So what better than to share our plotting tips and make that challenge a little less hard on ourselves? What writer isn't a fan of sticky notes? And here's a new way to put those little guys to use. When thinking about your story, list as many singular events as you can that will happen in your story. Jake arrives in town and it's different than he remembered...Jake meets Shannon...the bank forecloses on Jake's house. Write down every big or small event, in any order, you can think of that could happen in your story. When you're finished writing each event on a sticky note, put those sticky notes in chronological order. This gives you a chance to see how fleshed out your plot is, if you want to fill in the gaps, or transfer the timeline to a sheet of paper and go from there. You can even write from what you've got on your sticky notes and throw away each piece after the event happens. I know when I'm initially plotting I sometimes have trouble thinking up different disasters to put my characters through. So I ask strangers. Okay, maybe not complete strangers, but people who don't know what my story is about. I'll say to my family, "What if I just moved to a small town and ran out of money? What things could happen to make life (and finances) harder for me?" And they'll just shout out ideas. I do this with all sorts of what-if questions and my family or friends help me fill in gaps I'm struggling with so I can round out the plot, and do so with a different perspective. Sometimes I need compartmentalized structure. Because there are so many different aspects to a story, knowing GMC, external and internal goals, etc., I make categories for each main character. I LOVE plotting because it really helps me write a solid first draft. But I do it at different levels for different stories, hence the varying ideas above. How much do you plot? Would you like to be a more extensive plotter or not? And hey, while you're at it, if you have any easy plotting tips, do share! Cindy is a Colorado native, living near the mountains with her husband and three beautiful daughters. She writes contemporary Christian romance, seeking to enrich lives with her stories of faith, love, and a lot of humor. I've utilized all 3 of these resources to plot stories --sometimes simultaneously! But my all time favorite plotting tool is Susan May Warren's Book Buddy (Yes, I've said this before!). It's the best resource ever for thinking out your characters, your theme, your subplot/layer ... and then pulling it all together. And then I take all that info and transfer it to large sticky note and put 'em on the back of my office doors so I have easy access to them while I'm writing. When I wonder where I am in the story, I just look over and find the right note. I'm echoing Beth--the MBT Book Buddy is my favorite plotting tool in the world. I love, love, love it. I'm definitely a plotter, but I also like to leave room for surprises in my story. And the Book Buddy is perfect for that! Beth and Melissa, I think it's great you've found a tool that works for you. Having direction and feeling confident about where your story is going is invaluable. Have a great weekend! Okay, this is a Book Buddy day. I love tool too. I haven't gotten as into the sticky notes yet, mostly because I don't have anything large enough to stick everything on! I use sticky notes all the time! 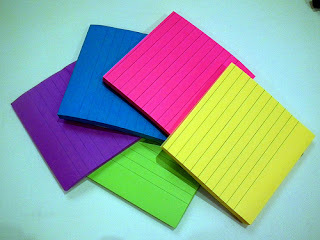 Well they aren't exactly sticky notes but their like sticky notes. Sometimes I write down stuff about characters on them. They are very handy! I'm using the Book Buddy for the first time and it rocks!! Definitely is helping me flesh out the big moments and my characters's motivations, lie, black moment, etc. I have just started using The Book Buddy and I love the idea of the Sticky Notes. Thanks. Jenna, don't you just love Sticky Notes? Writer's should be given a never-ending supply of them! Lindsay, so great to hear the Book Buddy is working for you. Definitely sounds like a great resource. Hi Sandra, I think we're all on the same page with Sticky Notes :) Such a great way to compartmentalize all different aspects of our story. I write the first draft free hand - then I plot. Free hand stamps my personal creativity and voice, and gives me plot turns that I didn't expect. That's just how I write. I do use sticky notes and brainstorming on the first read through. I love the idea about the sticky-notes! I've always thought that would be a good way to plot, but never actually played it out. Loree, that's great you have a method that works for you. Free hand and on the spot for a first draft really does allow you freedom to use your voice and be unique. Hi Missy! It's definitely a fun way to plot and get random ideas together so they make sense. Thanks for stopping by! I like the Book Buddy, too. But I was inspired by Beth's board...now I want to try the colored sticky notes. I'm a very visual person so I think this method would be helpful for me. Julia, colored sticky notes is a great idea, especially for those visual people. I'm loving everyone's ideas and comments on how they plot! All three of these sound GREAT! Need to try them for sure. Thanks, Cindy! Hi Joanne! I hope some of these ideas work for you! Have a great weekend. Such great ideas, Cindy! I especially like the sticky note one! Coming from one who likes plotting as much as she likes ironing laundry and mopping... I love this post! Thank you, Cindy, for taking the mystery out of the process! Hi, Niki! I'm glad some of these ideas resonated with you. And I agree, plotting can definitely be a mystery! Have a great weekend!